Original Broadway Cast, 2008 (Disney) (1 / 5) Howard Ashman sadly died at the height of his career, and he never saw any of his work with Alan Menken make it to Broadway. The legacy he left behind may be relatively small, but it is substantial in quality and much beloved. When Disney brought Beauty and the Beast to the stage with financially successful results, it was only a matter of time before The Little Mermaid, the movie that started it all, would make the transition as well. Unfortunately, in this case, Disney should have left well enough alone. With Ashman gone, Glenn Slater was brought in to contribute lyrics for new songs to expand the score for a full-length stage musical, and while he managed to come up with a few good fish puns, none of his work here matches the heart and inventiveness of Ashman’s work. 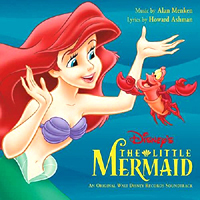 Menken wrote some lovely melodies for the additional songs, though some of them are recycled from incidental music heard in the movie. 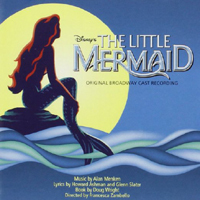 The cast — Sierra Boggess, Sean Palmer, Sherie Rene Scott, Tituss Burgess, Norm Lewis, et al. — is talented and, in a few cases, vocally superior to their film counterparts, but most tend to go for vocal tricks, making the majority of the score sound over-sung. While Danny Troob’s orchestrations add the necessary flashes of Broadway brass to the Menken-Ashman material without going overboard, they don’t bring as much flair to the Broadway additions. Even though this recording has more songs and offers vocal flair from some Broadway favorites, you’re better off sticking to the movie soundtrack. — M.K.